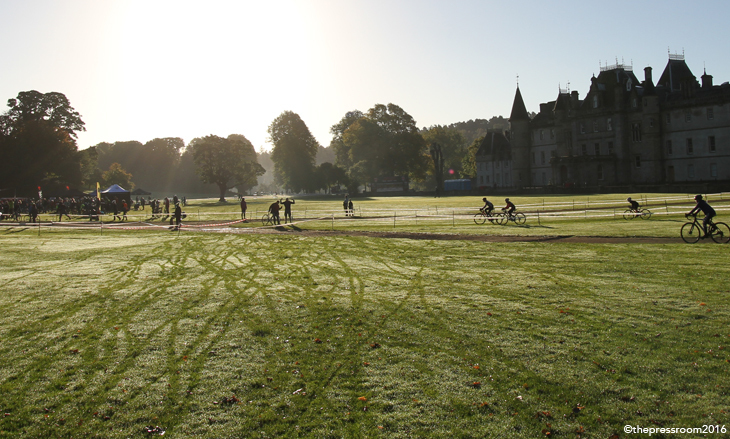 Callendar Park in Falkirk is often referred to as the best cyclocross course in Scotland, and who can argue with 600 registered riders? Sunday saw a lineup with 146 riders starting the V40 category alone. When the sun is shining down on competitors and spectators alike, the grounds of the park flowing out from the French chateau-like grand house, it’s easy to dismiss the hard work of Franco Porco and Davie Lines as pure luck. However Scottish cross is making its own luck at the moment, reaping the benefits of the dedication of a number of people. This was about as perfect a first weekend of Series racing as could have been hoped for. The dry weather in the run-up to the event meant for firm going, with just a slight cutting up in a few exposed areas that had taken on an overnight dew. Elsewhere there was dust being kicked up, and the racing responded by being extremely fast. The course here has a flow, where even the dead turns feel like a simple and smooth progression, the steep ups and downs being rideable but keeping you honest, the switchbacks keeping your front wheel on the very edge of grip. Transitions between points of interest were just long enough to decide between getting a breather in, or pressing home an advantage, but short enough that you didn't get bored waiting for the rollercoaster to restart. The paddock in front of the big hoose saw the majority of spectators and riders congregate, and each time passing, hoping your wheels wouldn't give way in the gravel and ping you into the metal railing, the shouts would grow and encourage. And almost all the while the sun beamed down. As ever it was the youngsters who kicked things off, demonstrating that fearless approach you hope they'll never lose.In the Under 8s Finn Crowther was the cream, with Angus Fraser-Moodie almost a minute behind. First girl home was third in the field, Melanie Rowe bringing it in just a minute and a half off the winner. 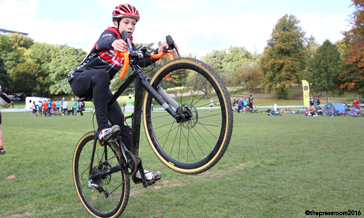 The Under 12s were somewhat closer, Patrick Barnes just edging out Finlay Taylor (despite posting the same time), with Jamie Thomson and Elliot Rowe pulling off the same trick for 3rd and 4th. Emily Carrick-Anderson (and there's a famous Scottish cross name) was first girl, nabbing a top ten finish in the process. The Under 14 male race had another Carrick-Anderson, this time Corran, earning the victory, ahead of Frederick Fuller and Ross Birrell, with Eilidh Shaw, Eva Young and Elena McGorum on the top three steps for the female race. Under 16s was a battle of the Annas, with Anna Flynn and Anna McGorum taking first and second respectively, again with the same time, and Anna Shackley on the third step. For the boys the ever-impressive Jamie Johnston was on top spot, followed by Callum Cooper and Rory McGuire. Then started the truly large fields of riders. The combined Junior/V50/Women's race had 132 riders on the start line. Cameron Mason was untouchable in the Junior male event, followed in by his teamate Conner Johnstone then Craig Dobbins; while the Junior women were a little closer together, Megan Wilkinson winning, just 35 seconds ahead of Eleanor Strathdee, and Katie Allen nabbing third. The senior women saw a fantastic battle develop between Jane Barr and Kerry MacPhee, that running all the way to the line, with Jane taking the victory by just two seconds on the final sprint. Maddy Robinson filled out the podium. For the vet women Sian Tovey won by just 5 seconds from Lindsay Branston, with Brenda Callander another 28 seconds behind in third; while the Vet50 men were taken home by Michael Nally, a little distance ahead of Gary Beall and Brian Nicholas, who were only separated by 4 seconds. It wasn't long before that enormous field size was eclipsed. The male V40 category has grown more than any other in recent years, and 147 of the auld yins (the writer included) were on the line. Perhaps even more remarkably 143 made it to the end (and last man home Eric Easton deserves a shout for the sheer amount of running he did). Gary McCrae was first over the line, followed in 22 seconds later by man-mountain Hans Forhaug, then ever-dangerous Stevie Jackson. Only time for a few deep breaths, then it was the senior men who took to the still-fast course. I may go as far as to suggest that this year may see the strongest top of the field so far in Scottish cross. When current series champion Davie Lines rolls home in 5th you know there's something special going on ahead (though we'll give him some leeway for being up at the sparrow's fart to set out the course). After a couple of laps with a stellar leading group, Harry Johnston imposed himelf, and rode away to a victory of almost a minute. That was ahead of Gary MacDonald, fresh (or perhaps not so) from his Three Peaks podium exploits, with Calum Magowan in 3rd. Allan Clark was the last man ahead of Lines, but with 2 and a half minutes covering the top 7 there are interesting times ahead in this category. And there's not long to wait. Sunday 23rd sees the entire circus set up camp in Aberdeenshire, and the dramatic natural surroundings of Knockburn Loch.